Many thanks to those of you who noticed my column missing from last Sunday’s paper. It was overlooked during the layout phase and didn’t appear until Tuesday. But all is well, because today is special day for me and all writers. It’s National Typewriter Day! Though my mother had lovely handwriting, she seldom wrote with pen and paper. Hers was the generation where girls took typing and shorthand in high school to prepare for careers as secretaries. Mother put that learning to good use even after she left the workforce to raise a family. She had a portable typewriter that weighed about a million pounds. She wrote letters, filled out forms and sometimes even made out her grocery list on that typewriter. Mother could type like the wind, and I was always fascinated and impressed. “How do you know where the letters are without looking?” I’d ask her. When I was in eleventh grade, I chose typing as an elective. It was the most practical course I took in school with the possible exception of driver’s ed. During fall semester, we trained on a manual typewriter. We learned how to “strike” the keys just right. We practiced jjj-space, fff-space. Before long, like magic, we knew the whole keyboard without looking. I didn’t understand how touch typing worked, but I sure knew how to do it. Spring semester typing was taught on electric typewriters, which were much easier to use. For Christmas that year, Santa brought me my very own portable electric typewriter. I put it to good use writing not only school papers but countless horrible poems and melodramatic short stories. One summer while I was in college, I worked as an intern at the Nashville Banner newspaper. Mostly what I did was write obituaries. But no matter. I had my own desk and my very own IBM Selectric Typewriter, complete with a correction button that allowed me to erase mistakes. Wowee Zowee. Who could even imagine something so wonderful? My fondest dream was to own one But before I could save up enough money, along came personal computers with word processing programs. Want to revise a sentence? Do it! Move a paragraph? Easy peasy. Don’t know how to spell a word? No problem. 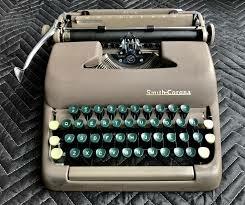 Even after all these years, I still miss the clickety-clack of a typewriter. The laptop computer I use now—a Dell Latitude—has a more tactile feel to the keyboard than others I’ve owned. I like that. And I remain forever grateful for the gift of touch typing. Whether I’m staring at a sheet of paper rolled onto a typewriter platen or at a blinking cursor on a computer screen, the process remains the same. My brain thinks of something I want to write. My fingers, somehow, respond. And words and sentences, black on white, appear.